Mike Carson hit 73 with the bat, but it was in vain for the Eastern Knights as the Western Warriors secured a thrilling comeback victory at Portgower Place today. Having won comfortably their opening Tilney Pro50 match of 2018 on Sunday at Forthill against the Caledonia Highlanders, the Knights went into this one at Mazars Grange’s ground feeling good. And things got off to a flying start, Watsonians duo Carson and George Munsey going at the Warriors bowlers from ball one before the latter was out for 33. The innings kept building and in the end they posted 255 all out from their 50 overs, Carson top scoring with his innings off 78 balls. 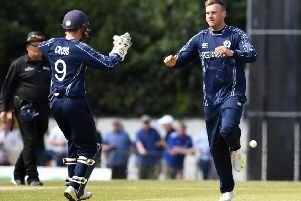 Peter Ross of Heriot’s chipped in with 35 while Ross Lyons, the former Carlton man, took three wickets for the men from the west. When spinner Mark Watt had Michael English trapped LBW early on in their reply the Warriors were struggling, slipping to 55-4 at one point. James Dickinson got the key wicket of Richie Berrington (35) to leave the visitors 110-5, but Riyaad Henry’s brilliant 95 gave them a chance. It was Watt who had Henry caught and bowled, however, the lower-order batsmen kept their cool for the Warriors and in a very tense finale they got home by two wickets. The Knights are next in action on May 28.